Engage your students in the creative process with dynamic art projects from Crystal Productions! These projects were created for elementary school children to build confidence, self-esteem and to facilitate their creation of artwork. 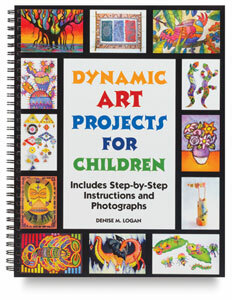 Over 200 color illustrations show step-by-step instructions for drawing and painting activities with paper, ceramics, printmaking, and sculpture. Projects include making abstract art, fantasy space art, landscapes, masks, printmaking, paper cutouts, mobiles, and many more. Elements and principles of design are emphasized. For grades K–6. Spiral-bound paperback. 112 pages. 8½" × 11" (22 cm × 28 cm).